This week MacGruber and Shrek both hit the big screen as movie franchises heading in decidedly different directions. The fact that I am even considering MacGruber as a possible franchise is a miracle in itself, but those guys from Saturday Night Live might be on to something. Meanwhile Shrek begins his big green walk off into the sunset. I think the biggest shock in movie history might be that critics actually like MacGruber. Saturday Night Live spin-off movies historically have been notoriously miss or miss with such works of critical acclaim as Ladies Man, Superstar and Night at the Roxbury representing in the last decade or so. Really only Wayne's World and Blues Brothers have ever successfully taken SNL characters out of Studio 8H, Rockefeller Center and on to the big screen with any great results. What's great about MacGruber compared to Leon Phelps, Mary Katherine Gallagher or the Butabi brothers is the MacGyver rip off has the least depth of any character ever produced on the SNL small screen. His skits involve sitting in a room, saying something outrageous, and then blowing up. Even the guys from Roxbury at least went clubbing. Maybe that's why the MacGruber thing is working so well. A bunch of SNL writers/actors Jorma Taccone, John Solome and of course, Will Forte got together and were able to basically create a character from scratch behind a flimsy premise (the guy couldn't figure his way out of a paper bag), rather than write a movie for a well known character(s) with a flimsy premise. And by all accounts, the MacGruber team got it right. As of today it sit at a perfect 100% on the TomatoMeter after eight reviews. It won't stay perfect, but how many negative Nellies are out there? Another promising aspect of MacGruber, assuming we knew nothing of the early reviews, is that guys like Val Kilmer and Ryan Phillippe, guys that just don't do comedies, read the script and decided to jump on board. Using that as the sole litmus test means the thing has to be good right? Right? 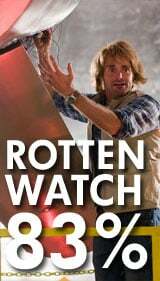 The Rotten Watch for MacGruber is 83%. Think about eating cheesecake. The first bite you think, “Wow, this is amazing, rich and delicious. I'd like some more of this.” The second bite you think, “Man I could get used to this. Still sumptuous, a little sweet, but I like it.” On the third bite, all of a sudden the sugar is getting to be a little much. You think, “I don't know how many more of this I can take. I am starting to feel sick.” On the fourth bite you wonder why you ordered it at all in the first place. Now it's just gross. You just stare at the unfinished slice wondering why anyone would cheesecake at all. That pretty much sums up Shrek. Dreamworks hit a homerun with the original tale of the Jolly Green Giant Ogre. It was a critical hit and killed at the box office. From a money standpoint, the franchise has done something I'm almost at a loss to describe. They've hit the equivalent of a game-winning grand slam where the batter gets to home plate and gets to bang a bevy of supermodels while signing a new multiyear contract. The Shrek franchise has grossed almost $1.5 billion at the box office alone. You read that number correctly. That doesn't even include DVD sales and the like. Shrek is, and has made, a ton of green. But that doesn't excuse the franchise from sliding down the critical slope with its last movie. Where the first two hovered in the 90% range, Shrek the Third rang it at 41% on the Tomatometer. At some point there are no more stories to tell. And yet here comes Shrek Forever After with the fourth and final installment (originally five were planned, but mercifully they scrapped that idea). Those critics who have seen it already have panned the flick (33% after six reviews) and I don't see it making any big push towards respectability. People are just ready for something new. 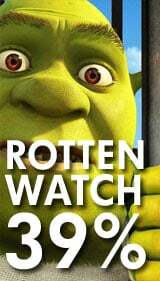 The Rotten Watch for Shrek Forever is 39%. Recapping last week: Robin Hood rode out of Sherwood Forest and into theaters where more than half of reviewers wanted him to ride away again (Prediction 67% Actual 45%). Cinemablend's Katey Rich was one of the naysayers. I can't get upset about this prediction, the trailer looked awesome. My other two predictions Letters to Juliet (Prediction 37% Actual 43%) and Just Wright (Prediction 52% Actual 47%) were almost dead on. Any Rotten Week where I'm not subsequently pelted with tomatoes is a good one. Next week we head to the desert when Samantha and her girls take their man-crazy act out of the city and Jake Gyllenhaal battles the sands of time. It's going to be a Rotten Week!